Magne Furuholmen released his new album "past perfect future tense" on 20 September 2004 in Norway and in the UK on 21 March 2005. The album was also available in Russia (released on "SOYUZ Records"), December 2005(?). The Norwegian 12 track album comes in a jewel case with an 8 page lyric booklet which includes more of Magne's artwork. The cover features some black and white artwork by Magne's. There are three white rings (one inside each other) on a black background with some white hand written text across the whole of the sleeve. The title is printed in the centre of the sleeve on a white background. 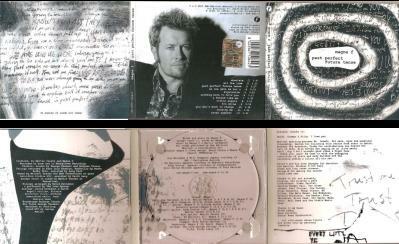 The reverse sleeve features a shot of Magne in front of a microphone on the right hand side with a less-focused similar shot on the left hand side. The track list is printed in black down the left hand side. The CD tray is transparent, through which you can see a picture of Magne in the bottom right hand corner with a large shadow of his head to the left. The disc is mainly white with black irregular stripes printed across the middle. The title is printed in white on one of the black stripes. A bonus track "Perfect Circle" is 'hidden' at the end of track 12. A promotional edition of the album was available for sale at Magne's Notting Hill gig. It comes in a tri-fold gatefold digi-pak sleeve. The cover is of similar design to the regular album and holds the lyric booklet in one end of the sleeve. The inside of the digi-pak features more of Magne's artwork: black hand-written text on a white background. The back of the digi-pak is similar to the regular editon, but uses a slightly different shot of Magne at the microphone. The track list is also printed lower down on the sleeve. The regular UK release is very similar to the promo edition in the gatefold sleeve. There are a few differences such as the catalogue number; the CD booklet has glossy pages compared to the matt finish of the promo booklet (the cover also has a slightly different finish); the lyrics for "Krytonite" and "Nothing Here To Hold You" are printed differently ("Kryptonite" lyrics are printed in white, easier to read, letters rather than black and the lyrics for "Nothing Here To Hold You" have been positioned differently over the background, again making them easier to read) and the album was manufactured in the UK. The regular album was used for promotional purposes in the UK and hence there are copies available which have a www.radiopromotions.co.uk sticker with telephone number and the text "solo album from Mags from AHA copies available for competitions". There is a UK fold-out digipak version with a sticker on the front which has information in English including a quote from Time Out Magazine. It has a slightly different back cover picture (same scene, different shot). There is a 12 track promo CD-R edition of the album. It comes with a paper insert which is similar to the cover of the regular album, but slightly more of the cover art can be seen. The disc is white with the title at the top in black and the track list down the right hand side plus copyright information at the bottom. The red "Private and Confidential Records" logo has been printed on the left side of the disc. Some copies of this promo have a sticker on the reverse which says "After 21 million albums sold and having co-written Take On Me, The Living Daylights, Cry Wolf, Hunting High & Low and The Sun Always Shines On TV, amongst others, Magne F releases his debut album on March 21. Keane, Coldplay, Travis and U2's The Edge all cite A-ha as a major influence and Will & Guy from Coldplay, Andy Dunlop from Travis & Ed Harcourt all join Magne on the new album.". 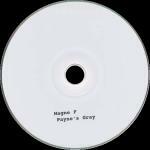 Another promotional copy of the album comes with a boxed edition of Magne's new book "Payne's Gray". The CD features the same tracks as the album, but the disc design is quite different featuring a picture of a collection of mussels! The box is black with a small art print by Magne in the centre and the text "Magne F Payne's Gray limited edition" and "Hatje Cantz" (publisher). 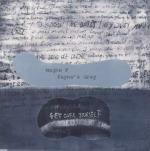 The book was published in connection with Magne's exhibition "Payne's Gray" and features his artwork ("Get Over Yourself") on the cover with "Magne F Payne's Gray" printed on a grey background in the centre. The reverse of the book is white featuring some "Trust Me!" artwork. The book features many pictures, text and artwork. Each box is signed and numbered. The UK promo album sampler CD, released by "Private and Confidential Records", comes in a jewel case and doesn't have a sleeve. The disc is white with the title and track details in black. The "Private and Confidential Records" logo is printed in red on the left hand side of the disc. An orange sticker with a contact phone number for "Red Shadow" can be found on the front of the jewel case. There are 5 tracks on this sample CD: Kryptonite; 2cU Shine; No One Gets Me But U; Past Perfect Future Tense and All The Time. There's another promo sampler CD which has the same track list as the one mentioned above. The disc is also white with the title and track list in black, but the "Private and Confidential Records" logo is missing. The fonts used on the CD differ slightly and the text "Album Sampler Promotional Copy - Not For Resale" is printed at the top of the disc (compared with 'Past Perfect Future Tense' Sampler on the other CD). The orange sticker is also present on the front of the case. There is a very limited (500 copies?) 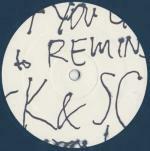 promo 12" which features three regular versions of songs from the album plus several sound collages of the other songs. You can obtain a copy of this 12" by purchasing (for 50,000 NOK) a set of 12 Magne art prints. 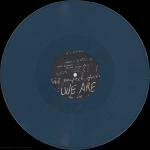 The 12" is blue and has a black and white art disc stickers. 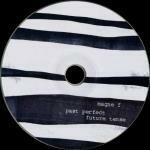 The label on side 1 is black with white arty hand-written text and the title "magne f past present future tense" printed at the top. The label on side 2 is white with black art writing. The 12" doesn't have a catalogue number. 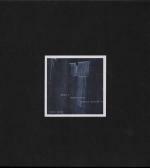 There is also a 1-track promo CD "Payne's Gray" which features a unique "You need to get your life fixed" intro of "Past Perfect Future Tense" mastered with 5 short clips of other tracks [Kryptonite / Little Angels / 2cU Shine / Kryptonite / No One Gets Me But U] (5:02). This CD was used as the invitation to the opening of Magne's Payne's Gray exhibition at the Henie Onstad Art Centre in Oslo on 16th September. 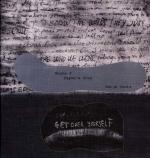 The front sleeve features "Get Over Yourself" artwork by Magne. The reverse is white with text about the invitation and adverts for the London and Edinburgh exhibitions plus the London concert. The disc is white with "Magne F Payne's Gray" printed in small black letters at the bottom. There is another "Payne's Gray" 1-track promo single which, on first look, appears to be the same as the one given out in Oslo. Both the front cover and disc are much the same (except for small differences in the printing colours). However, the back sleeves are different. 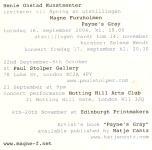 The one used for promotion in the UK has "Magne F Payne's Gray (Drawing from memory)" printed at the top with details of the London exhibition, Notting Hill concert and Edinburgh exhibition below. 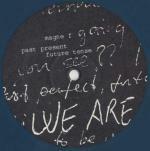 The CD also includes "Past Perfect Future Tense" with a unique intro plus 6 short clips of other tracks from the album. 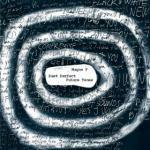 France: There is a French edition which comes in a jewel case and has a large black sticker on the front with white text including the words: "Un groupe culte est né!". The back sleeve features a unique shot of Magne which is similar to the Russian edition (see below). 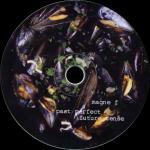 Italy: From June 2006, Italian newsagents were selling a new version of "Past Perfect Future Tense". It comes in a fold-out digi-pak and was distributed by an independent company "FMA". The artwork of the digi-pak differs from the European release with a black and white close-up shot of Magne on the reverse. The CD is packaged with some rubber writsbands in a "MP3 Compilation" "Summer Kit". Russia: The Russian edition comes in a jewel case. It has similar cover to the Norwegian / UK release. The back cover features a different shot of Magne wearing a red shirt and looking down. It comes with a picture obi-strip and the booklet is glossy. Russia Past Perfect Future Tense SOYUZ Records ?